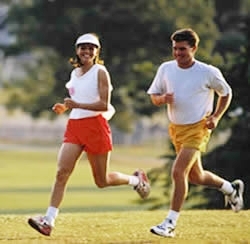 Go into any article on the net and you’ll find hundreds of articles on the health benefits of jogging, and quite a few on the psychological ones as well. Jogging improves blood circulation – the anaerobic exercise is excellent for the health of your heart and will help with cases of hypertension, high blood pressure or poor blood circulation. You are going to be visiting your doctor a lot less. The fitter you become the stronger your bodies immunity system becomes, saving you on doctors’ bills. All that you cash you are currently spending on diets? No more, you are going to lose weight the normal way. Gym fees, a thing of the past. Yes you should cross train but this can be done with a set of barbells at home. Sure there are some costs involved to start, but weigh up these against any other sport out there and you will find its way cheaper to start running. And lastly, this to me is one of the top benefits and is worth more than all the benefits put together. The ability to join your son or daughter on their early morning run, do it and you will see what I mean. Yes i know it’s tough when you start out but there’s no way around it, the honest truth is that your first few weeks of running seem like hell. The trick is not to do too much in one go, train consistently and never, ever give up.